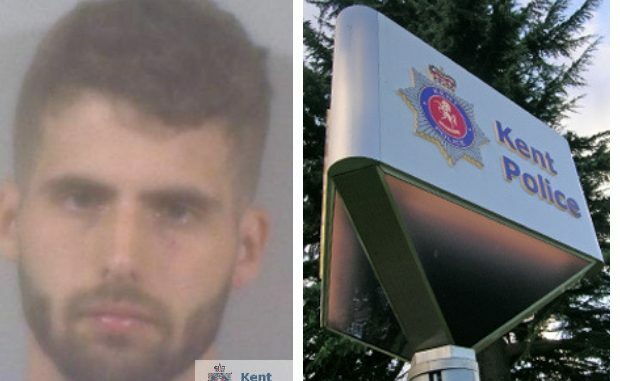 A thief who police had to chase through several gardens after stolen jewellery was found in a house in Margate has been jailed for more than four years. Samuel Hodges, 24, was discovered with the stolen goods -including an entire drawer of jewellery – after Kent Police officers searched a property he was living in at Gainsborough Avenue, Margate on Thursday 8 November 2018. When officers entered the house Hodges jumped from the bedroom window and was chased down the street through a number of gardens until he was detained and arrested. The search of the property uncovered a bag full of jewellery, a stolen bedroom drawer and a jewellery box containing three rings that was balancing on the edge of the window he jumped from. Once in custody, Hodges was identified on CCTV, which had been captured earlier that day during a burglary in Northdown Road at 3.15pm. Further searches were carried out in gardens near to Northdown Road where jewellery had been dropped or discarded. Nearly all of the items, including the drawer, belonged to the burglary victim who was reunited with her possessions. Hodges admitted to the burglary and a charge of handling stolen goods. He was sentenced to four years and six months at Canterbury Crown Court on January 22. Investigating officer Detective Constable Andrew Rogers said: “Hodges was caught red-handed after literally stealing an entire drawer full of jewellery. The victim was very thankful to get her belongings back but that doesn’t change the fact he broke into her home and went through her things. “Burglary is an intrusive offence that can cause a great deal of upset for victims and we are committed to doing all we can to bring offenders to justice.